Alright, so it’s been a little while since I’ve posted an article for this place, maybe because I just don’t have much to really talk about on a consistent basis. I’ve just been trying to enjoy my summer holidays while I still have them, by not playing as many games as I should be playing. Not watching as much interesting things as I should be. Or even drawing as much as I should be, especially considering I’m in the middle of a university degree which needs me to constantly be drawing to improve my skills in art and animation in general. I don’t know, I suppose it’s down to other issues that would be too personal and dull to talk about with random strangers over the internet with, but if there’s one thing that I have somehow managed to keep a log of on a daily basis, it’s my professional wrestling. Now, some of you may have read my more recent wrestling themed articles where I have managed to attend live events in the country, while others who know me back when my mind was more innocent and fragile remember me reviewing mainstream company Pay Per View events and other weekly shows (but please don’t read those, I cringe just thinking about them, let alone reading them back again). But, in some of the more recent articles I may have mentioned once or twice that I actually decided to take my childhood hobby more seriously and actually take training classes in professional wrestling. At the time when I started, I didn’t know if it would be a good enough time to talk about as I was so new to it, and even now I’m only a little over two months into my training, but I feel as though enough has happened since I’ve started to at least say a few things that have happened to me. 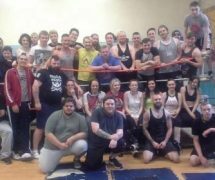 So, in case anyone is wondering where I am actually training, it’s with a promotion based in Newport called ‘Dragon Pro Wrestling‘, which is run by Mike Bird. I take classes every Tuesday night and Sunday morning/afternoon unless other life events get in the way. I really don’t want to bore you too much with the more technical aspects in what I learn on a weekly basis as first of all, that would again be very dull to read, also I feel that I don’t really have the right to talk said mechanics as I am still learning, and I wouldn’t be able to explain it any good in actual words. The things they teach you at these sessions, like locking-up, shoulder rolls, warming-up, taking bumps, executing moves and sequences, are all better learnt from these sessions, you know, by actually attending and taking part in them. It’s kind of like teaching someone how to draw. You can read tips about it in a book or watch a tutorial online, and while you’d learn some useful things, until you put pencil to paper, or pen to tablet, or whatever art analogy you want to use, you aren’t really doing anything. Wow, I should really take my own advice looking back at that sentence – art wise. Anyway, another reason why I didn’t feel like talking about my wrestling training right now is because, I guess I felt like I didn’t belong there. I mean, I saw many different people from all different walks of life there. People in their mid-20s, some in their 30s, some aren’t even old enough to legally go drinking in the pub yet. Some of these people have also been training from between a few months to a few years! Some are being booked on shows with Dragon Pro, others aren’t quite yet. Most are physically fit, others (looks as self) not so much. And talking about experience levels, most of the trainers there are only a few years apart from me in age range and they’ve been doing this for years, one of them is even younger than me and has done it for around four – crazy! So you have me, an awkward, anti-social man-child in his early twenties, showing up out of nowhere, and I just feel… out of place, and not in a good way. But the weird thing is, none of it mattered. Since I’ve been attending more regularly, I’ve got to work with most of these people, got to get reads on their personalities, and everyone is just so… accepting. It doesn’t matter what level of fitness you are, or if you don’t have experience to become something, they are all in training, just like I am, to get better at these things. It also helps that everyone to me – so far – has just been so kind. Whether it’s the trainers, the trainees or the others who drive some of them down and watch from the sides. Everyone is willing to shake your hand or at least accept your handshake at the start and end of these sessions. But, two events recently really helped me realise just how great everyone here is at Dragon Pro. In two sessions this August we managed to have two guest trainers who taught us different aspects of the wrestling business. 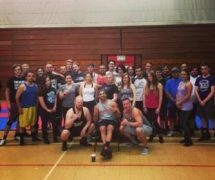 We had Dragon Pro graduate and TNA British Boot Camp 2 Winner, Mark Andrews, appear out of his latest tour with his band to help everyone with ring work, something I was (and still am) new to, and the next session we had TNA wrestler Robbie E appear to talk about creating characters and how to talk to an audience. Both experiences were beyond life-changing to me, maybe that sounds a little over-dramatic, but in a way, it kind of did. Because I learnt so much from both sessions, even if I didn’t do as well as I would have liked to have done, both were still learning experiences, and even if I messed up, others around me messed up. Even some of the more experienced people messed up, and that made me realise something important – we are people. We screw up from time to time – no matter how good we are at something. But we still want to get better, to improve on our faults, and while we ourselves have to do this over anyone else, it makes it all the more worth it when you have other trainees clapping and cheering you on, supporting you. It was these two sessions that made me realise, that maybe I just might have a place in all of this after all. I mean, I ended up having a decent trip to the pub after one of these sessions with everyone so I guess that’s a step in the right direction, right? So yeah, I’m not sure what else to say right now. I mean, again, I’m still learning. I have much longer to go in this new journey I’ve started, but during a time when I thought it might not be for me, now more than ever? I think I might stick with it a while longer. Hopefully it will improve me not just in knowing how to wrestle or in general fitness, but as a better person as well. Now, if only it could improve my financial situation right now, seriously though, over £15 a week to get to and from there, my wallet has been crying for months now. What? You expected me to end on a happy note? Ha, that part of me won’t change for a long time.